If anyone notices any bugs, please let me know. I will try to fix whatever ones I can find before the final release. I found 2 so far..Rox freezes when exploring the /proc folder (Thunar is OK) , and I forgot to remove the old get-flashplayer portion inside of delayedrun. I haven't compiled any wifi drivers yet, so I will have to do some research first. Wary 5.2 which I find buggy. 3) Some Rox Filer Bookmarks would be nice. My program Quick Launch can use these Bookmarks. 4) Bacon Recorder should be installed. using double click. My fingers fail to do such fast repeating of movement. So how do I change it to single click . I know how to in Rox but does Ice have Rox? Okay I test it before I go to bed or tomorrow. In Rox-Filer, right-click in the window and choose options. Actually, I'll just add some screenshots. 1st pic is for single-clicking inside of the ROX-Filer windows...and the 2nd pic is for single-clicking of icons on the desktop. This is not an insult...I urge you to experiment. If you break puppy, just reboot in clean mode or in another pup and remove your savefile. I always keep a backup copy of my save file. There were so many times I broke Windows...but that's how I learned how to fix it. Same thing goes with Puppy. A lot of the stuff you learn by trial and error. Don't be afraid..if you don't try, you don't learn. I recommend you fool around with the software and not be afraid. One exception would be. don't try flashing the bios if your scared of the consequences. I have flashed my bioses several times with success, but one time I bricked one of my computers..
but I built it out of cheap parts anyway. And after, I built a better one. Thanks for the Single Click is the puppy way. Yes I noticed this and got happy about it. she loves the double click too. and maybe there are others. wrong at all. Just me being too lazy. I already have all the other puppies so me spoiled indeed. that I couldn't get back to sleep. I think I might be getting a little too obssessed with this..lol. I'm a night owl and usually sleep in till at least 10:00am. Anyways, I hacked the Get-Internet Apps at the last minute before uploading it and now I have discovered a problem with it. Dowloading and installing the packages are fine, but when you try to uninstall them, it looks like everything worked, according to Puppy Package Manager, but the packages are still there. So I reverted back to the older install script, which is used for Get GnomeOffice. Method1: If you have a copy of the downloaded pet, just reinstall it and uninstall it again in PuppyPackageManager. Medthod2:: Install the attatched patch, re-download and install the Internet App, and uninstall it in PPM. I was also going over some of don570's suggestions...ROX bookmarks is a nice touch so I added it. Also made a link for top and nicoedit as suggested. There are already 2 snapshot utilities included, but I'll try psnapshot later along with bacon recorder. Also modified the delayedrun script. Okay, I think I can rest easy and take a snooze for another hour. Thanks to the early-birds for testing this beta release. Edit: I did not fix the uninstall option for flashplayer. Even though it's a bug, I kinda like it that way cause the install appears more seemless and flashplayer doesn't really need to be removed. When you upgrade, the new flashplayer will overwrite the old one anyway. Firefox 8 seems to run great on my system, without problems of freezing as reported elsewheres in the forum. Maybe it was the automatic upgrade that was the problem. Sigh, in my haste this morning, I made the patch and didn't test it before uploading. I found that I didn't add in any variables for Seamonkey so wget doesn't know where to find it. The patch has been reuploaded...I actually tested it this time, so to the 4 people who already downloaded the patch, please download the new one...sorry. Is it me or is the forum taking extra long to update messages today? You shouldn't use psnapshot, just look at the scripts. that it has a default folder----> Screenshots. I will take a look at the script you mentioned. 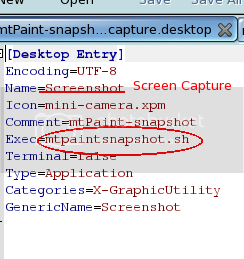 I now noticed I have duplicate versions of mtpaintsnapshot.sh and mtpaintscreenhot.sh. I decided to rename it to prevent it from being overwritten. Here's how I would change the scripts to do screen capture. Thanks for the suggestion about mtpaintsnapshot. So if I get this right, the main difference between your version and the standard mtpaint screen capture is that your version automatically designates the save folder, correct? Thanks for taking the trouble of doing the code work for me. I am still a rookie coder. It took me half a day to figure out how to create Get-GnomeOffice. I analyzed your code and understand most of it, but one line still eludes me..probably becuase I haven't used the sed command yet. You idea to have a default folder to save screenshots is good, but I prefer the gui to look like the one I have preinstalled. I'm not totally sure, but I think it was 01micko who wrote it, since it's also found in Slacko. I will see if I can combine the two scripts. I analyzed your code and understand most of it, but one line still eludes me..probably becuase I haven't used the sed command yet. There are 2 included sound recorders, and to be honest I never really use them to any great extent. I just rememeber testing them very quickly several months back. Today I spent time trying out Precord and Mhwaveedit again, along with your Bacon Recorder. I don't want more than 2 apps per task, in most cases I prefer to have just one. I've decided I will take out Precord and Replace it with Bacon Recorder. Since you were kind enough to make suggestions for improvement, I've done so for you in the Bacon Recorder thread, thanks. Yes, I've added your 2 lines of code and cofirm that it works..thank you. I would use the default gui you've included for mtpaintsnapshot, but often, I need only 5 seconds and 10 secs is too long a wait for impatient me. I don't really use the 20 seconds option but...just in case. This does a substitution except when 'Screenshots' is in the line. I've forgotten what the exclamation mark represents??? is that it works correctly.